The first time I ate this siew mai was at a Taiwanese Restaurant. I remember ordering a plate of siew mai thinking that is like any other meat siew mai commonly served at dim sum places but I was wrong. This one came with glutinous rice wrap in wanton wrappers. 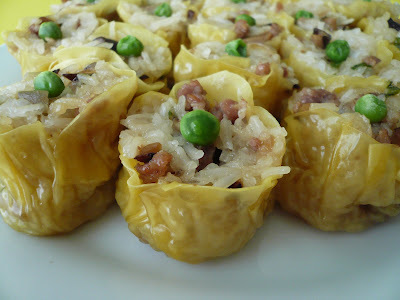 After seeing Belachan siew mai it kind of reminds me of this. 1) Rinse and drain glutinious rice, add water and steam for 30 minutes. 2) Heat a bit of oil in a frying pan stir-fry meat, dried shrimp and mushroom until lightly brown. Add in garlic, oyster sauce, soy sauce and pepper for another few second. Lastly add in the spring onions. 3) Remove from heat and stir into the steam rice. Mix well. If the rice is too dry add in about 2-3 tbsp of water to loosen up the mixture. Set aside to cool. 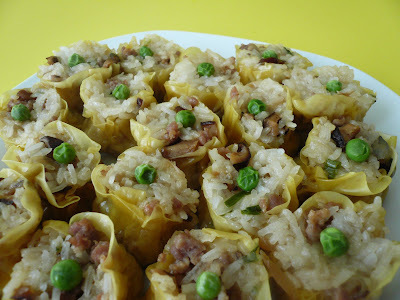 4) To make siew mai, add a tablespoon of rice in the middle of the wrapper. Gather up the side and squeeze lightly. While holding the siew mai, use the back of the spoon the push the filling in and flatten the bottom. 5) Garnish the top with green peas and steam on high heat for 7-10 minutes. Serve warm. Yum..I love siew mai. I haven't tasted this variety before, interesting. Gertrude, I have a question. I tried your recipe for the berries muffin and it came out great. I even substituted half with whole wheat flour. Now the question: What can I substitute for butter that won't change the taste or texture of the muffin? Wow! First time seeing this kind of siew mai and it sure looks delicious! YUMMY! Nyum..nyumm delicious! It looks hard to make, so delicate, but in one bite terus habis masuk mulut.How many pieces should a person eat this delicacy? Arghhhhhhhhhhhh!!!! I want to have a dim sum shop with you in it!lovely, divine, salivating, gorgeous, fragrant, ohhhhhh I am lost with words! Glutinous Rice Wrap Siew Mai... this is the first time i heard of this name!!!! LCOM, if you visit a Taiwanese rest. check their menu as they might have this. Cat, the house is still available. BBO, want to be business partner? BigFish, I find this dim sum interesting too. Thanks for visiting my humble blog! :) Wah, this is the 1st time me seeing siew mai wz glutinious rice. must be very yummy!!! Thanks for posting...am learning new things every day. Hey Gert, nice looking siew mai you've got there! You know, you should really open a restaurant. You're a fantastic cook! gert - thanks for the suggestion. I do have another dummy question. Hope you don't mind. I see that most muffin recipes call for milk but yours doesn't and they still came out great. What's the secret? Is milk a crucial ingredient? 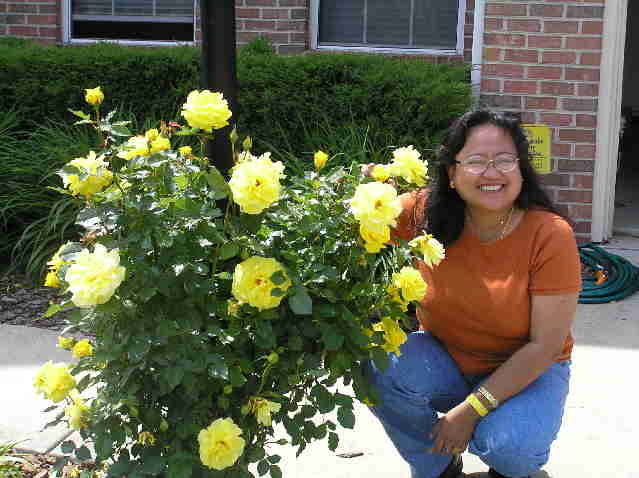 jadepearl, Kong Hei Fatt Choy to you and your family too!! Hooi Imm, yes, most of muffins recipes call for milk. As you can see I used yogurt to replaced the milk for my berries muffins and for the banana muffins I didn't put any milk because the banana gave natural moistness to the muffins. If I make other kind of muffins I will definately put some milk to it. Hope this help. Gert.. wanton wrapper tu kulit popia ka? Sama ngan kulit seafood pocket/bundle tu ke?